Linking to a web page is very easy, both in simple HTML and in ASP.NET. Linking to a page that really exists, passing the right parameters, and parsing these parameters, is a bit different. Let's take a simple example. You want to call a page that displays information about a customer. The page expects a customer ID. Let's say that ID is an integer. 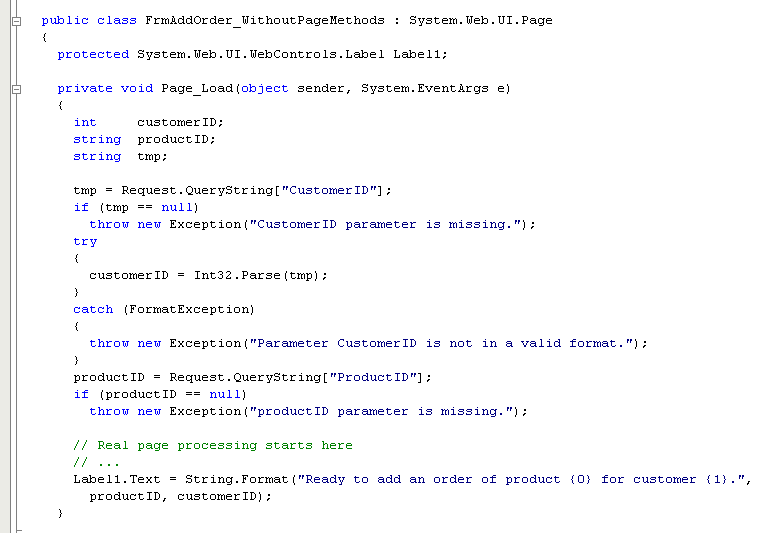 If you're not the developer who created the page, how do you know the name of the parameter? How do you know the type of this parameter? Either you have to look deep in the code of the page you want to invoke (do you always have that code at hand, by the way? Not so sure), or you look in the documentation related to that page (does such documentation exist? Is this documentation up-to-date? Did Joe update the documentation when he quickly renamed the parameter from CustID to CustomerID?). PageMethods takes care of your URLs. It proposes a solution to define structured URLs for each of your pages, as well as a clean and simple way to call them. The idea is based on strict page inputs and declarative parameter binding. With PageMethods, each page exposes a set of methods that represent the different ways to call the page. All you have to do to start benefiting from sharp URLs is to add methods to your pages, and mark these methods with attributes provided by PageMethods. A bit of code tells a lot, so let's compare the source code for the PageMethods solution and for the standard solution. You can quickly get a deeper overview on how PageMethods is used by reading the tutorial. You can also decide to learn more about the features and benefits.